The extra large black heated hoodie is powered by the M12 REDLITHIUM battery. Each heated hoodie uses carbon fiber heating elements to create and distribute heat to the chest and back. A single touch LED controller heats up the battery heated hoodie to three heat settings. This MILWAUKEE heated hoodie kit has a new Quick-Heat funtion that allows you to feel heat three times faster than our previous hoodies and market competitors. The hooded sweatshirts are built with a durable cotton/polyester exterior and waffle weave thermal lining. This provides a versatile three-season solution to keep heat trapped in without bulky additional layers. DEWALT 20-Volt/12-Volt MAX black heated Hoodie. 20-Volt MAX and 12-Volt MAX batteries can provide hours of core body warmth and continuous heat. Up to 7 hours of runtime on low setting using the 20-Volt MAX compact 1.5Ah battery. Durable water and wind resistant cotton twill outer shell. 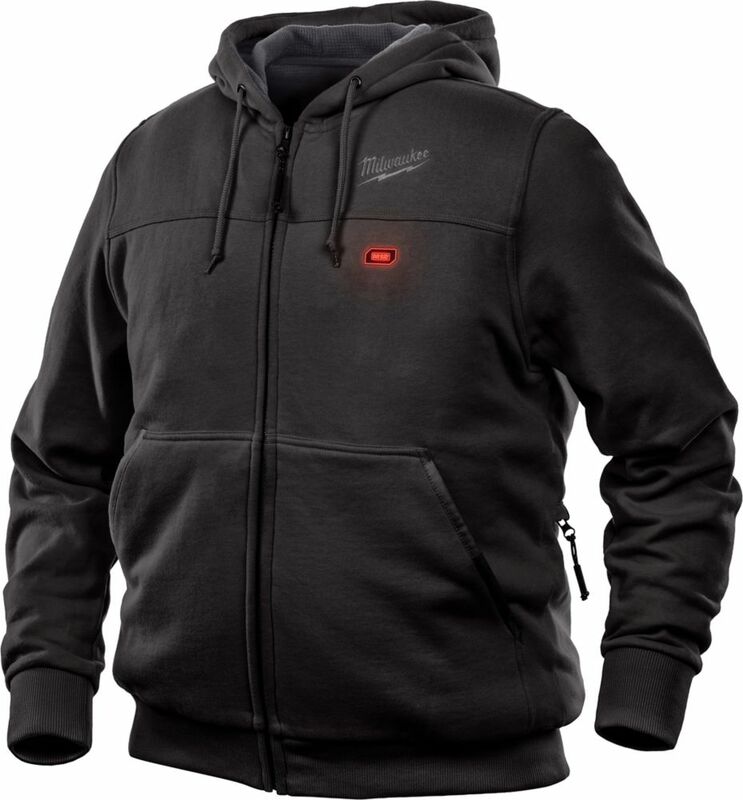 Powered by M12 REDLITHIUM Battery Technology, Milwaukee<sup></sup> M12 Heated Hoodies use carbon fiber heating elements to create and distribute heat to the chest and back. Combining a durable cotton/polyester exterior with a waffle weave thermal lining, the hoodie provides a versatile three-season solution to keep heat in and allow users to shed bulky layers. The XXL red heated hoodie is powered by the M12 REDLITHIUM battery. Each heated hoodie uses carbon fiber heating elements to create and distribute heat to the chest and back. A single touch LED controller heats up the battery heated hoodie to three heat settings. This MILWAUKEE heated hoodie kit has a new Quick-Heat funtion that allows you to feel heat three times faster than our previous hoodies and market competitors. The hooded sweatshirts are built with a durable cotton/polyester exterior and waffle weave thermal lining. This provides a versatile three-season solution to keep heat trapped in without bulky additional layers. The medium gray heated hoodie is powered by the M12 REDLITHIUM battery. Each heated hoodie uses carbon fiber heating elements to create and distribute heat to the chest and back. A single touch LED controller heats up the battery heated hoodie to three heat settings. This MILWAUKEE heated hoodie kit has a new Quick-Heat funtion that allows you to feel heat three times faster than our previous hoodies and market competitors. The hooded sweatshirts are built with a durable cotton/polyester exterior and waffle weave thermal lining. This provides a versatile three-season solution to keep heat trapped in without bulky additional layers. Men's X-Large M12 12-Volt Lithium-Ion Cordless Black Heated Hoodie (Tool Only) The extra large black heated hoodie is powered by the M12 REDLITHIUM battery. Each heated hoodie uses carbon fiber heating elements to create and distribute heat to the chest and back. A single touch LED controller heats up the battery heated hoodie to three heat settings. This MILWAUKEE heated hoodie kit has a new Quick-Heat funtion that allows you to feel heat three times faster than our previous hoodies and market competitors. The hooded sweatshirts are built with a durable cotton/polyester exterior and waffle weave thermal lining. This provides a versatile three-season solution to keep heat trapped in without bulky additional layers. Men's X-Large M12 12-Volt Lithium-Ion Cordless Black Heated Hoodie (Tool Only) is rated 4.5 out of 5 by 15. Rated 5 out of 5 by Mckayla from My boyfriend loves his jacket! He works in a warehouse... My boyfriend loves his jacket! He works in a warehouse so he’s always in and out he says it keeps him warm. He can turn the jacket on let it warm up and turn it off and it will stay warm for a while. It is also a nice material so it is easy to move around in. Rated 2 out of 5 by Holly from Didn’t get hot enough to keep so I returned it.... Didn’t get hot enough to keep so I returned it. Rated 5 out of 5 by Zcooll from Comfortable. Works good. ... Comfortable. Works good.